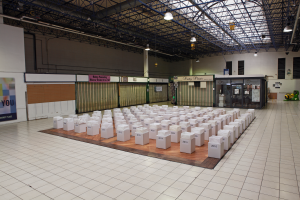 This installation at The Priory Market Place between June and August 2016 was an overwhelming success. Look out for the publication of the 500 stories in due course. If you would like your story to be part of this publication, please share your story here. If you are interested in obtaining a copy of this book please contact Annie here. 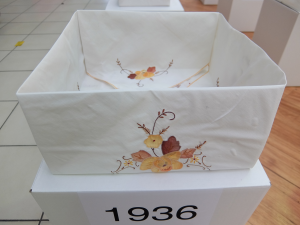 This installation of 100 memory boxes is made from used fabrics, for 100 years of Dartford history from 1917 to 2016. It invites the audience to share their individual stories, experience and transform the interactive installation, and contribute to the bigger story of the community. Continuing my journey from my previous works, I have moved onto collecting larger pieces of materials. Each table cloth or bed sheet tells of a specific person, with an individual story, at a particular time. Making the 100 boxes has been a time and labour intensive process. Each box is made entirely from one piece of fabric, which is folded after it has been stiffened. The way it is made says something about the layering of stories and memories, until a different but not separate entity takes shape and emerges. Each box will contain the stories of a particular year. 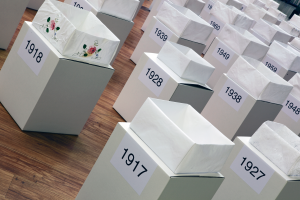 The 100 boxes tell the stories of 100 years. The making marks time and the installation invites the audience to experience time, where individual stories make up a bigger story and personal memories contribute to the history and identity of the community. This installation is commissioned by Francis Knight Public Art Consultancy on behalf of Dartford Creative.